If there is one easy dessert that is made with everyday ingredients from the pantry in my house it’s an Italian tiramisu. When I make a tiramisu I don’t always use the traditional Italian tiramisu ingredients as you will find out today. This evening I have friends coming over for dinner and I somehow managed to forget some ingredients on my grocery list to make my tiramisu cake, oops! 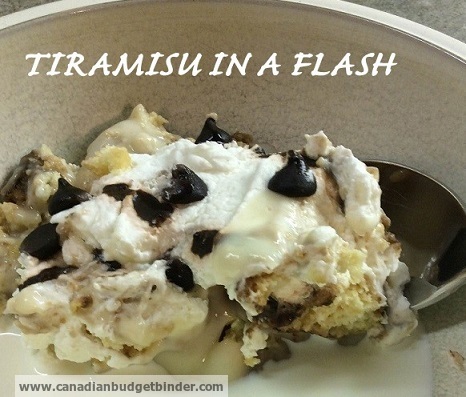 This tiramisu dessert could have easily turned into a disaster but since I keep a well stalked pantry I was able to create my signature tiramisu in a flash. Experimenting and taking everyday ingredients out of the pantry and making something extraordinary is why I love cooking so much. Instead of using a creamy mascarpone cheese mixture I found a packet of vanilla pudding to use in place of the creamy custard type layers. Since I bake quite often I had chocolate on hand. The other week I bulked out on Italian “S Cookies” as they were on sale for $0.88 for a pack of 12. You can also use Italian lady fingers which is a traditional cookie in the tiramisu recipe. I use lady fingers at Christmas for my festive trifle recipe. Voila I have everything. I love my coffee machine so that went on to brew the strong coffee needed to give the tiramisu cake the deep coffee flavour we’ve all come to love. Coffee is a must for this Italian dessert and I must admit I do put sherry in there too but you can miss this ingredient out as it’s not essential. The stronger the coffee the better. I have a Tassimo machine so usually when making tiramisu I will use either espresso or mocha without the milk. If you don’t have a machine no worries instant coffee will do the trick as well. Traditionally tiramisu is an Italian recipe made with lady fingers, mascarpone cheese and a strong coffee most often espresso coffee. Mascarpone cheese is one of those containers of cheese you see at the grocery store but you never know why you should buy it. Along with creme fraiche and heavy clotted cream which can both be used as similar substitutes to mascarpone most often they get left behind because people don’t know what they are used for. They do come with a heavy price tag but if you keep an eye out you might find them on special once in a while. A container of mascarpone can set you back up $6.00 depending on the brand you buy. If all else fails ricotta cheese and cream cheese will also do the trick according to cheese expert Jennifer Meier. Tiramisu is all about layering ingredients as well as soaking cookies with a strong coffee. Tiramisu is a no-bake cake. If you are looking for a simple Italian dessert that will wow your guests this tiramisu cake will make it seem as if you were slaving away in the kitchen all day, but you really weren’t. Creating a tiramisu is similar to creating a trifle when assembling as it’s tiered. The reason for the tiers is so your guests get lots of lovely creamy spoonfuls when dishing out this rich dessert which I top with chocolate chips. You can make the tiramisu cake in a pan, trifle dish or simply in glasses like Mr.CBB did one year for St. Patrick’s Day with his Custard Cookie Coffee Trifle or his Mum’s British Lemon Fridge Cake. Although he didn’t use mascarpone cheese the custard base was used with the lady fingers ( I use Italian “S cookies” and coffee in each layer like my tiramisu recipe today. If you love Italian desserts this tiramisu recipe is easy to make and although it doesn't use the traditional mascarpone cheese this is a recipe you can make with everyday pantry essentials. 1½ packets Italian lady fingers or "S cookies"
Dip rest of lady fingers into coffee mixture and again make another layer. Whip cream until thick and spoon over the last layer of fingers pushing slightly down. Ensure all lady fingers are covered. This may not be the Italian version that you will find in Italy but it’s my version of a quick tiramisu that you can make when you don’t have all the traditional ingredients on hand. Matt it’s a really simple recipe but looks and tastes so luxurious! Enjoy! I am sure the kids will love it too . Let us all know how it turns out! While I was reading your post, my wife looked at it and asked the recipe. Then, I printed it out. She’s actually making this tomorrow for us especially for our kids. They’ll surely like this tiramisu. Thanks!